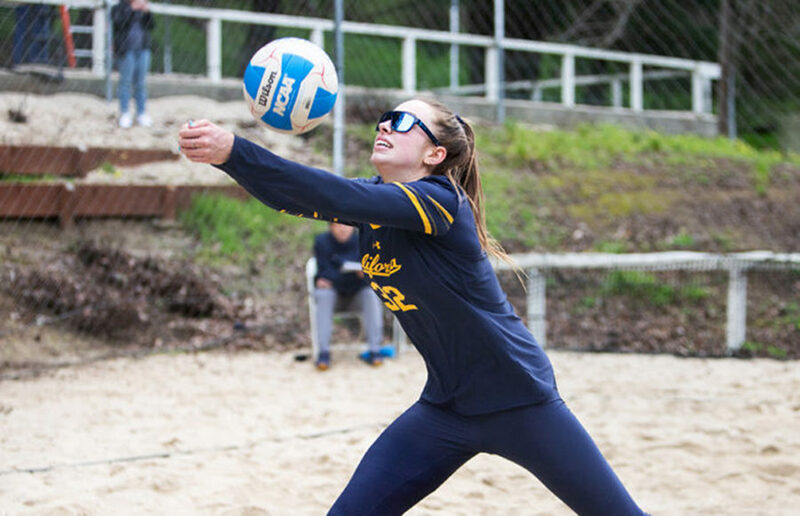 Cal beach volleyball has spent all season working toward one primary final goal: qualification for the NCAA national championship tournament. Even with the team’s stellar record of 16-5, this feat is still a bit out of reach for the Bears. According to the NCAA website, there are 69 collegiate women’s beach volleyball teams across the country, a number that has been growing steadily over the last few years as the sport gains popularity. The national championship will only feature eight of those teams. The NCAA Women’s Beach Volleyball Committee is in charge of selecting teams at the end of the regular season, with three finalists coming from the East Region and three from the West Region while the other two are selected from anywhere in the country. Current rankings featured on the NCAA website place Cal at No. 12, a position that has been fairly consistent for the Bears all season. Of the 11 teams above them, Cal has already faced and fallen to three of them — No. 1 UCLA (twice), No. 6 Hawai’i and No. 2 USC. In the coming weeks, the Bears have several scheduled matches against unfamiliar competition in the form of ranked opponents such as No. 9 Long Beach State, No. 7 Cal Poly and No. 5 Pepperdine. After a weekend of predictable wins and loses, these upcoming games will be the Bears’ best shot at moving up in the ranks. Every win counts. The Pac-12 North Tournament was a pretty neutral event for the Bears, as they split the weekend with two losses Saturday and two wins Sunday. The first day of play pitted the Bears against the Trojans for the first time this season. Sophomore Mima Mirkovic, who plays a vital role for Cal on the ones team, was sidelined on this first day with the flu, leaving her normal partner, freshman Jordan Polo, to team up with regular No. 2 sophomore Caroline Schafer. The new duo was handily defeated by its USC and UCLA counterparts in two sets each. The No. 2 and 3 teams went on to lose their matches in similar 2-0 fashion, while the No. 4 and 5 teams were a bit more competitive in three sets. In the end, the Trojans took the matchup, 5-0. Just a few hours later, the Bears had to face an even more daunting opponent in the form of the then-undefeated Bruins. After such a tough match in the morning and a previous loss to the defending national champion looming over the court, another 5-0 defeat seemed predictable. Cal’s No. 3 pair of senior Grace Campbell and junior Iya Lindahl, however, stopped a blowout when the two players took their match, coming back to win the second and third sets after losing the first, 21-16. No other pair of Bears was able to take a set off of UCLA, and the Bruins took the competition, 4-1. But this small win on the part of the Bears — in addition to the Bruins’ 2-3 loss to the Trojans the next day that finally ended their undefeated streak — shows that the reigning national champions aren’t untouchable. Mirkovic was able to make a miraculous recovery and had her toes back in the sand alongside Polo for these two matches. The duo lost its first match in three sets against Washington but came back for a decisive win against its Cardinal rivals. Against Washington, the No. 2 through 5 matches went to Cal, sealing another victory over the Huskies. Stanford proved a bit more competitive, taking the No. 2 and No. 4 matches. In the end, the Bears were able to defeat their rival on enemy territory once again, 3-2. With mirrored wins and loses, this weekend may have been neutral in terms of record. But the experience against teams as tough as UCLA and USC is vital and, while these matches were still losses, they will hopefully leave the Bears more prepared for future competition with high-ranked but more vulnerable teams.